"Today, we raised our key policy rate by 25 basis points in the context of an economy that is approaching full capacity, and with inflation expected to reach the two per cent target within the next year," said Bank of Canada governor Stephen Poloz during a press conference. What exactly is the overnight rate? Basically, the overnight rate (also referred to as the key policy rate) is the interest rate banks charge each other when they lend money amongst themselves. When the overnight rate increases or decreases, the banks typically follow suit and adjust their prime interest rate to reflect the change. As a result, an adjustment to the overnight rate will usually affect mortgage rates, loans, and lines of credit. "Changes in the target for the overnight rate influence other interest rates, such as those for consumer loans and mortgages. 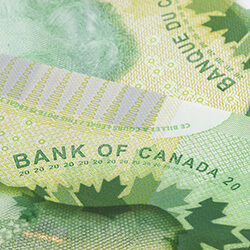 They can also affect the exchange rate of the Canadian dollar," the Bank of Canada says on its website. The overnight rate also affects the interest rate paid on deposits, GICs and other savings vehicles. Prior to the Bank of Canada's announcement, the prime lending rate at all five of Canada's big banks sat at 2.7 per cent. However, just hours after the announcement was made, all five banks (BMO, CIBC, RBC, Scotiabank, and TD) issued releases stating they were raising their prime lending rate by 25 basis points to 2.95 per cent. "The growth in our confidence that the economy is on a solid trajectory should be good news for everybody," said Poloz. "I know not everybody will think a higher interest rate is good news, but it is a symptom of an improving economy. Interest rates are still very low." Although rates are still low, the Bank of Canada will be keeping an eye on how this increase will impact Canadians. "The economy may be more sensitive to higher interest rates than in the past, given the accumulation of household debt," explained Poloz. "We'll need to gauge carefully the effects of higher interest rates on the economy." More rate hikes to follow? Many economists are predicting more rate hikes in the near future. Economists from each of Canada's five big banks are predicting at least one additional rate hike before the year is over. The next scheduled rate announcement is September 6, 2017, followed by October 25 and December 6. If you're planning your weekends around open houses, make sure you compare mortgage rates before sealing the deal because every percent counts. And, with predictions there are possibly more rate hikes on the horizon, you'll want to be confident that you're getting the best mortgage rate possible. Compare mortgage rates from 30+ financial partners at Kanetix.ca, and easily connect with the lender for your best rate.